They sat at the table and the teacher started to serve the tea. He poured and poured until the tea started to run over. I realized it was for me. While I follow Jesus I can learn from this story. If I want to teach others I must learn more. If I want to learn more I must have a mind ready to receive more knowledge. Lord, this week having opportunity to teach what I know and give away of myself, help me to empty my cup that was running over. I want to start learning again and again, filling my cup with you over and over again. If I know that God is with me, if I know that I can worship Him wherever I am, and anytime I want, if my communion with God is so clear and strong that my spirit is full of the assurance of His presence, then why do I have to go to church? 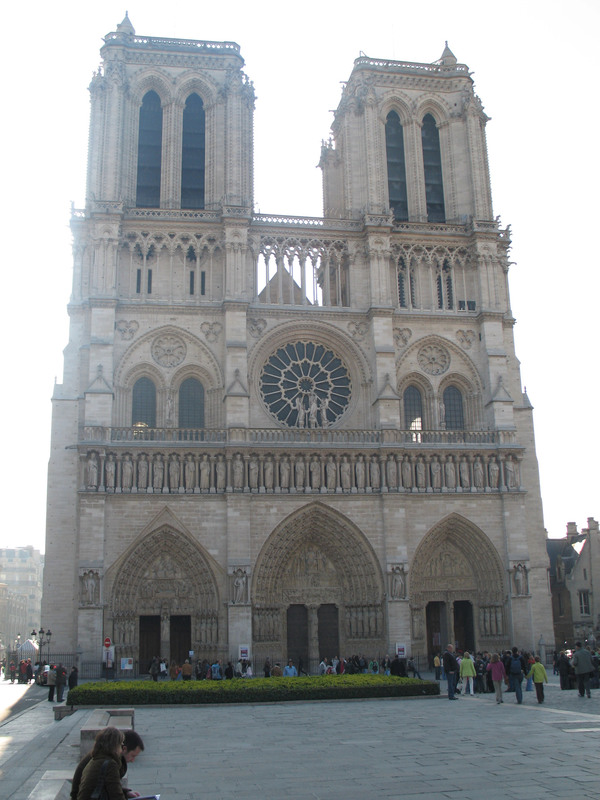 Notre Dame is a magnificent church surrounded with magnificent stain glass windows. Walking around the outside of the church those windows are dark and dirty. There is no beauty. But, inside the church, the windows are majestic, even taking the breath from the people who admire them. It is the sun going through that shows the designs and colors. The light that brings the purity of the color and makes the inside monumental, giving a different aspect. It’s warm and beautifully undescribable. And it’s the same with us. We have that beauty inside of us that cannot be seen. But when the sun breaks in that’s when we can reflect our beauty. The sun, I can call this the church worship, that comes from outside to our inner temple and brings out the beauty of the reflections of the light of our soul. 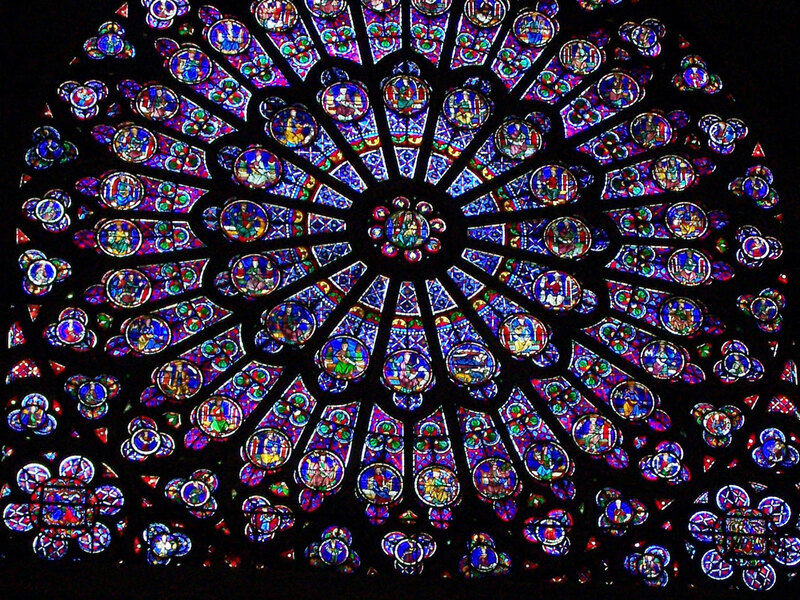 With our stain glass windows that surround us in church we make the most magnificent cathedral of spiritual worship. When we leave the church service we take with us more light than what we started with. That’s why we go to church. I heard a story once. It went like this. Once upon a time, there was a little girl, who was not happy about who she was. So she decided to try to act like others and become someone else. Every time she tried to act like others, she failed. The more she tried the more she failed and the worse she felt. Until one day, she realized there were more characteristics of others in her than there were of who she really was. She decided just to be her own plain self. Voilà! She succeeded and decided for herself that it was easier and happier to be herself than trying to be someone else. I experienced this lesson when I started teaching Chinese Brush painting. It was suppose to be only a few lessons to people who did not have knowledge at all of this art technique. As it turned out, two of my students had been serious students of this art for years and one of them was in reality Chinese. I felt crushed. What was I suppose to do. Then, after the above story came to my dreams, I decided to be just me and teach what I knew. And you know, it was alright. The class was a success. My student who was Chinese knew the language, but she learned from me the art of the brush. In years past when you wanted to keep an image of a beautiful landscape or the face of a lovely person, you’d load film into a camera and with a quick click it was safe in your camera. But, it wasn’t any good until you developed the film. Once done, the photo could be replicated in many forms and shared with others. The same is true with the marvelous thoughts that come to you. If you have them but keep them in your mind, what good are they? If you don’t develop your ideas and share them with others, what good are they? Plant a little seed with your words and let it out to grow. Do something about your thoughts. I have a weight problem. . .or even worse. . .a wait problem! You lift weights to be strong physically, but you must learn to wait to be strong spiritually. Our faith fails when we fail to wait on God. We try to solve our own problems with our own efforts. We try to force our own agendas in His Name. Make your plans “as best you can,” but when circumstances beyond your control occur, wait on the Lord. All things, all circumstances, are subject to His will. His plans are to prosper you. All that you can control is your response to circumstances. How was your Grudge Sale? Fridays and Saturdays are good days for Garage Sales. . .but Sundays are made for Grudge Sales. Grudges are heavy, costly, and toxic. The longer we hold them, the more they harden our hearts, warp our thinking, and affect our ability to see and hear correctly. Jesus paid the full price for our Grudges. . .as He did for all our sins. He then challenges us to forgive others as He has forgiven us. Today is Monday. If you find that there is the smallest Grudge leftover from Sunday. . .throw it out with the trash before it grows and infects another week. Invest yourself. . .your efforts. . .in the best. . .the blessed. I’m writing to you not of today but of tomorrows. Today you’re occupied in many things that for me are not very important, but for you they’re important. So many things seem unnecessary. Having so many places to be, but in the end nobody will care. I had all that. I had to have it. I had to belong. I was important. I thought and acted like that. Thinking all the time about desired things, having to be on the go, having to belong to some group where I was important. Then one day it all changed. In the end, when tomorrow comes, the only thing that matters is what we are on the inside. We want to claim something as ‘mine’. But, in the end, nothing is ours. We try so hard to show how powerful and smart we are, how we made it by ourselves, how different we are from others. And, yet, we never stop to remember that nothing is ours. God thought and created us to his own image, so time belongs to Him. At the start of our life, we borrowed from his time since it truly belongs to God. We have talent, but it’s a gift to apply in some way to God’s plan. So often our actions are strongly centered on the me, myself, and I that there’s no place for the real “I”. We do sometimes think we have things belonging to us in body, soul, mind, and talent. But, really, we don’t own anything, we are “owned”. Man was created free with some limitations. God put into place those restrictions because He loves and cares for us. I need a friend so badly that I can cry. I want someone just to be a friend. Maybe I don’t know how to be one. Maybe I just don’t understand what being a friend means. Just feeling that emptiness of my soul. What more can I do to have a friend? Where do I have to go to find it? I am here and waiting? Come my friend I need to talk to you. In the middle of a group trip through the mountains, we stopped to admire the landscape that was in front of us. It was supreme, unbelievable, so much to see and comprehend. We turned our heads all around trying to see everything, and even in that way we couldn’t see it all at once for our eyes could only capture a section at a time. Even still it was tremendous. We were so impressed with the view that each person made an attempt to let the people we left at home know all about this place. One person took a picture with a polaroid camera that spit out the photo shortly after you pressed the button. Details of the scene were transformed in the photo either because the camera could only focus on one spot, or because the colors were transformed and not the true colors. In any case, the photo looked funny and did not capture the beauty of this place. Another person painted a picture. He painted only a section of the view of what his eyes could see. The painting was fabulous and of course the artist could see what he left out. But in the eyes of others it was a nice painting and nothing more. Another person decided to write a poem. His description was great, and when he read it his emotions were expressed through the tears in his eyes. But when he passed it to others, they read it with cold emotion. Only a touch of inspiration was noted but they saw only a poem. Another person decided to take a tablet and describe it. Taking the time to put her thoughts in what she saw, trying to describe every detail that she remembered. In another’s hand it was a long description with many details of a nice place. But, without the knowledge of the place it became a long, long summary. Oh, oh, oh. And when comparing the picture, the painting, the poem and the description of this place it was like they were describing different locations. Yet we know it was the same place. Isn’t that the same with God, with our faith, with our religion. Think about it. How can we express in one minute, in one hour, in one life time the whole panorama of the magnificence of God? How can we express the emotion that comes in us and most of all how can we make ourselves understood for the people that haven’t been there? So let us, being simple, start with understanding the words “I am”. Over the years I presented devotionals to many lady’s groups. I remember being asked to give a devotional following a presentation on China. And of all things I was to present after the program. Ah well . . . I thought . . . I’m stuck at the Chinese fortune cookie end. Which I realized wasn’t a bad idea after all. Two days before the program, the lady in charge informed me the subject had been changed to ‘secrets’ . . . instead of China. This meant I needed to change the devotions too. But then I realized that I had the same idea after all because Chinese fortune cookies keep secrets. The Chinese people invented that simple cookie formula containing a wish, a secret, a prophecy. It has everyone eager to open the cookie and read the message. That made me think – we are really a fortune cookie. We have inside of us “a secret,” a great prophesy and until we bring it out nobody can see it. Not even ourselves. We cannot know what it contains if we don’t make an effort to see inside of us. That is true. We have a secret. And it’s the best secret we can keep, hidden within us. We have a whole treasure inside of us. We want to show it and share it with others. The only thing required is to search for it in the treasure chest of our mind. When I shared the fortune cookie analogy with the ladies of the group I included a few affirming Bible verses. And, no one minded being compared to a fortune cookie. Marji Laine on What’s for Dessert?